You can even make it look better than this crappy mock-up of mine, if you like. 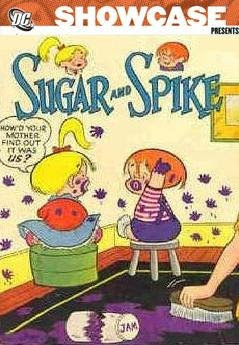 Given the success Dark Horse has had with Little Lulu, the excitement about their upcoming Herbie Popnecker collection(s), and the crossover appeal of cute kid-based comics like Yotsuba&!, I think that DC's insistence that there's no sort of market for this material today is a load of GFBLSTXK*. * Which, of course, is babytalk for exactly what you think it is. Or possibly "shoehorn." Babytalk is very tricky like that. I'm beginning to think I'm one of the few folks alive that actually liked Time Masters. I thought it was a decent update of the 1960s Rip Hunter material. It was no New Frontier by any stretch, but I thought it was enjoyable. Worth collecting in a trade? Not really, especially when you get all of the back issues for about half what the trade would cost. I wanted to like Time Masters, but even back then, I was annoyed that A.) it was written to solve a nonexistent problem (the "rules" of time travel in the DC Universe), and B.) it actually created a real problem in that the new rules were so confusing, I don't recall them ever being mentioned again. They dropped that concept even quicker than Hypertime.